Reminder: "Let's Talk iPhone" event today! There are probably very few of you who are not aware that today's the day for every tech junkie out there, as we'll be witnessing the official announcement of the next-gen iPhone/s. But for those few calendar-impaired individuals, we've taken the liberty of posting a reminder! 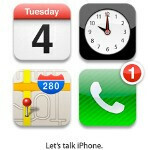 The so-called "Let's Talk iPhone" event will take place today, starting at 10AM PST | 12PM CST | 1PM EST | 6PM GMT. Whether we'll be seeing an all-new iPhone 5, a facelifted iPhone 4S, or both... we don't know, but one thing is certain - it will be very, very interesting. So, be sure to stay tuned to PhoneArena, as we'll be covering all that is going on at the event, and more! I have an inner feeling that Tim is a very bad Cook. At least Steve had people longing for Jobs at Apple. Sorry, but your jokes were extremely cheeky and crap. This might be good, or bad.. We shall see. Oi - Oi look! Did you see it remixfa? An iSheep! Quickly my friend - draw your rifle and hunt it down - Promised my gf some fresh meat this dinner. If it were - it would be the best iPhone ever. In all seriousness, for a change. Hell, a full working Android 3.0+ bootloader is the prime reason I check Cydia every morning. To be honest, as someone who owns a Thunderbolt and has been using Android since the Droid one when I switched from my iPhone... I am very excited for the iPhone event. Over the last couple years I have been VERY pro Android because I honestly believe it is a more capable OS, but iOS is definitely more refined. I am very much hoping that Apple has made some major improvements over the iPhone 4 in which case I may consider switching back. As much as I hate all of the Apple fanboys on this website sometimes, and as much as I do honestly believe that currently Android outperforms iOS... All I want is the best phone. With the best features. Competition brings innovation! Let's see it Apple. I don't get how you can say the iOS is more "refined"? iOS is indeed an inferior OS. The reason why you think is more "refined" is because it seems smoother. The way Apple achieves this is because their iOS can't multitask. Look you take a Samsung Galaxy S II with its dual-core 1.2 GHz Exynos chipset & run iOS is will be smoother, faster in every which way compared the iPhone 4. You just can’t dispute that. Now try to run Android Gingerbread 2.3.5 on an iPhone 4 & you will see that it just can't happen. Android demands the extra power because it is LITERALLY doing 100 more things at once compared to iOS. I got my wife the Samsung Galaxy S II Epic 4G Touch & let me tell you it's insanely fast & JUST as smooth as the iOS on Apple's iPhone 4. The difference is that the Epic Touch 4G is constantly multitasking & using Flash. To me this is finally the phone that can ACTUALLY run the Android OS without a hitch. I am flabbergasted at the thought of how awesome Android Ice Cream Sandwich will run on the glorious 1.2 GHz dual-core Exynos chipset. Apple will always have a nice flashy phone I give you that, but with quad-core phones just a few months away, a dual-core iPhone just seems like old news. Innovation would be a quad-core iPhone, but the rumors don't stipulate something like that, but don't worry we will soon know what Apple has up its sleeve that is for sure! Dude, you try to argue everything! Its just accepted and known that ios is more refined. it has to be since there is one person in control! Androids biggest advantage is also its biggest flaw. bucky how am I arguing if it's indeed facts? iOS is smooth because the OS is dumbed down. That is why it’s more refined? Really? Even iSheep know this, ask taco50, ask The_Miz. They have been quoted as saying this. I am not making this up. Android is a more advanced OS, that is not speculation that is FACT! iOS just can't do what Android can. There is no argument there! So I really don’t know what you are talking about! Your definition of refinement is different from his. I actually agree... iOS is simpler and more straightforward, but less capable. It's like comparing a bicycle to a motorcycle. Sure, they each have two wheels, handbars and a seat, but the bicycle is simpler, easier to maintain and far less powerful. Which one is more elegant depends on whether you're a bicyclist or a biker. Great analogy. That was wonderful. I am a bicyclist, who also owns a motorcycle. I can agree with you, but if you are comparing them as a vehicles then there is no comparison the motorcycle is hands down the better choice. There is no better feeling then riding a motorcycle on a nice curvy road. The feeling is exhilarating. Now if you want a leisurely ride then a bicycle will give you that. When I want time think & be by myself there is nothing better than riding my bicycle. It’s very liberating, not to mention the fitness it requires. When comparing OS’s Android is the better choice for multi-tasking, but to say iOS is more "refined" because it does less sounds very diminishing. Just because Android multitasks doesn't mean it's NOT refined. The Android OS on the Samsung Galaxy S II or other high-end devices are just as "refined" as iOS is on an Apple iPhone 4 even though Android is doing 100 different things at all times. Refinement has to do with compatibility, smoothness, solidity, looks and quality in general. Android lacks those in 95% of their phones. Apps arent nearly as refined either. The sgs2 is the only phone that really puts up a fight in most of those categories. bucky you are making numbers up. There are more quality Android phones out there than you think. The low-end Android phone is not as common as you think. Android is moving so fast that today’s high-end phone will be tomorrows mid-tier phone, & next month’s low-end phone. A lot of mid to low-end phones that are coming out will be stronger than the iPhone 4. The iPhone 4 is not even 1 GHz. Just look & see for yourself. its easy to polish it shiney when its only 1 or 2 things. its much harder to polish everything when its 30 thigs. I don't know why i'm getting thumbs down... lol It doesn't matter WHY iOS "seems" more refined. It doesn't matter if it's because it doesn't have true multitasking or whatever the reason may be... the reality of it is that it SEEMS SMOOTHER. Who the F*** cares how you come to that conclusion. I honestly thought my post was very unbiased and straightforward. My old Mazda 626 had no options (no power locks, windows, etc) but NONE OF THAT s**t BROKE. Yes it is nice to have all the bells and whistles (which again, I have owned several Droids now and would never consider an iPhone unless they improve it to be as capable as Android) but bells and whistles tend to have problems here and there. I am very much an Android "fan" but I am realistic about it as well... and the reality is that while Android is MORE CAPABLE and can do MORE THINGS than iOS, iPhones tend to perform better. I completely agree with WHY and it is definitely because the phone is doing less, but the end result is what I am talking about here... and in this case the end result is that the LESS CAPABLE iOS is in fact SMOOTHER. Right? "iphone5.. now with more "android"!!! dont worry, our robot is silver, not green, so we are not "stealing" per se!!" Cant wait to see what else they have added to the mix. I'm so ready to dump Tmobile and my Sensation. We hate the iPhone because we still can't understand to this day how a phone with old slower hardware with an OS that hasn't changed in 4 years is selling like hotcakes. It's like saying, "why is a 2008 Macbook nonPro selling more than an Asus quadcore 3.5Ghz with 16gb Ram and the latest video card?" It just doesn't make any sense. Be we have come to realize that Apple can sell you "not so smart" people anything they want because their marketing tactics are genius. They could probably sell you a hot pile of poop with a Benjamin on the bottom and an Apple sticker on the top for $800. Granted they leak everything out slowly telling you what shade of brown it is and if the poop is going to be bigger than 3.7" or not with corn or rice in it. Apple's marketing rocks.